2 Killed, Others Injured In Fiery Accident In Greenacres | Schuler, Halvorson, Weisser, Zoeller & Overbeck P.A. A crash involving two vehicles caused one to catch fire in a quiet Greenacres neighborhood. 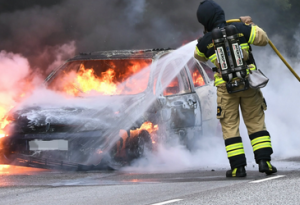 The fiery crash happened after driver of a Porsche violently collided with a Honda CRV causing the two occupants of the CRV to be forcefully thrown from the Honda CRV to their deaths. Authorities say the Honda CRV caught fire shortly after impact. The Porsche’s driver sustained major injuries in the crash, the Palm Beach County Sheriff’s Office said. A nearby business’s security cameras captured footage of the crash. Both drivers were not wearing seatbelts prior to the fiery crash. The crash at Swain Boulevard and Second Street killed two men both of suburban West Palm Beach who were passengers in the Honda CRV. The identities of the victims will be released only after their relatives have been informed, the sheriff’s office said. They were passengers in a 2007 Honda CRV driven by a 43-year-old Palm Beach man who suffered extensive burn injuries. First emergency responders arrived shortly after the accident and both drivers were transported to the hospital in critical conditions. Two lanes were blocked at the intersection of Swain Boulevard and Second Street due to the severity of the crash, causing traffic delays. Vehicles on this route are pulling to the roadside to allow crews work. The delay of traffic on this route is due to the severity of the crash. Drivers are advised to use an alternative route until investigations are completed, a deputy said.